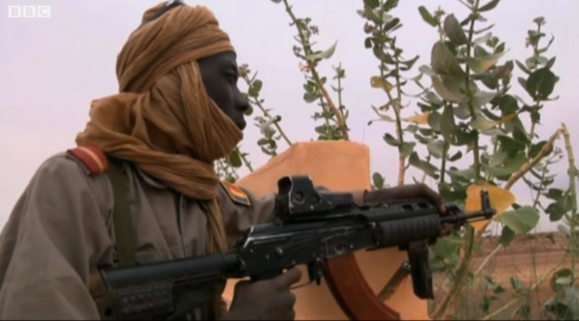 […] I haven’t had time to review the kit of Chadian soldiers generally. So I can’t say whether this rifle is a one-off or now a standard in some Chad ground units. If the latter, and Chad’s arms-procurement officials have fitted out their AKs in such fashion, then some defense contractor or arms salesman somewhere may have made a fine penny. And if the latter, it would also be interesting to see a thoughtful analysis on whether such supposed upgrades have had any measurable effect on any units so equipped, or if money has been misspent. This raises even more questions. First, no matter if it’s a one-off or a whole lot, why has it been assembled? Were there simply worn AKMs and parts of other rifles around? In other words: Is the hybrid the result of a chance seen within necessity? Or has it been designed deliberately? Following a set of æsthetics? If so, by whom are these æsthetics shared? By the manufacturers and the soldiers? Then, as Chivers hinted at, it’s completely unclear if the hybrid makes operational sense. Is it a good or a bad bricolage? Does it cater to operational needs, to æsthetic sense, to both, or none? The same question can be posed to ‘the modern Western military obsession with rails, sights, tactical grips and collapsing stocks.’ It’s quite probable that there are more hybrid weapon specimen around Africa and elsewhere—I’d like to see them and hear their stories. That’s a fine picture, KerLeone, tnx! Still I think it is probable that the rifle is working, because the non-AKM parts, as C. J. Chivers pointed out, make the whole contraption into a ‘cosmetic hybrid.’ Meaning that those parts aren’t essential for the gun’s basic working. They should be attached stoutly, though. The stock especially. Apart from finger-on-trigger making no sense when switched on safe, the whole way the man holds the gun doesn’t make much sense. It’s a pose for the picture, for sure. By the way, klandestino, the way the characters in FPS’ like e.g. ‘Counter-Strike’ hold their assault rifles is exactly the way you are taught to in military CQB (close quarters battle) training courses.